Several mutations that arose during the 2013-2016 outbreak of Ebola virus in West Africa were previously found to increase infectivity for human cells. However, a study in two animal models show no effect of these mutations on disease. Among the many mutations identified among the hundreds of genome sequences obtained during the 2013-2016 Ebola virus epidemic, a change from alanine to valine at position 82 (A82V) that arose early in the outbreak was found to increase infectivity in human cells of HIV particles with the Ebola virus glycoprotein. The authors suggested that this change might have been in part responsible for the extent and severity of the outbreak. As pointed out previously, experiments in cell culture do not predict what might happen in humans. 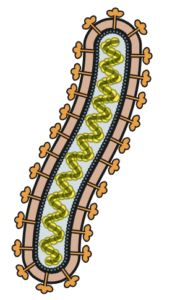 To address this issue, the effect of the A82V change, as well as two others in the viral genome that might impact viral fitness, were studied in two animal models of Ebola virus infection. Viruses with amino acid changes replicated to lower titers in human cell cultures compared with viruses without the changes. The growth phenotype in cell culture is the opposite of results published previously. An explanation might be that the current study employed clinical isolates, with multiple changes, compared with pseudotyped viruses harboring single amino acid changes. The data from infections of mice and macaques suggest that the virus became attenuated, not adapted, during the West African epidemic by the fixation of amino acid changes in GP, L, and NP. This hypothesis is the opposite of that proposed based on the effects of these changes in cell culture. Yet it is consistent with the outbreak having the lowest case fatality ratio (~40%) of any Ebolavirus outbreak. We did not find any evidence based on tissue culture and animal modeling for changes in the EBOV-Makona genome over time that would account for increased viral fitness, pathogenicity, or transmissibility of later phase clinical isolates and thus explain high case and fatality numbers and increased human-to-human transmission, as seen during the West African EBOV epidemic. Authors admit that animal models are a proxy for what occurs in humans – which is also true for experiments in cell culture. Nevertheless, disease pathogenesis and transmissibility can be studied in animals but not in cell culture. Based on these findings, the authors suggest that it is ‘time to more closely revisit non-pathogen related factors when trying to find explanations for unique and unprecedented characteristics of the West African EBOV epidemic’. It’s become too easy to blame mutations in the viral genome for novel patterns of transmission or pathogenesis. Let’s think about other determinants, such as susceptibility of human populations, immune status, vector availability, poor health care systems, and population mobility, to name just a few.